The fair is back in town! Rides, games, animals, music, fried oreos, and more! Check out the tickets pricing and schedule. Cost Varies. HERE. This long running festival features folk instruments including the Appalachian (lap) dulcimer, but others play hammered dulcimers, guitars, etc. Everyone is welcome, especially anyone who plays an acoustic stringed instrument and enjoys traditional music! If you enjoy folk music, this is a can’t miss! Bring a bag chair and take in some classic Appalachian music! FREE. More info HERE. Party on the Porch is back for the first event of 2017! Head to the Homewood location for fun, food, local craft beer, music and giveaways benefiting Freshwater Land Trust ! Come out for a chance to win 2 General Admission tickets to Sloss Music & Arts Festival! This is a family friendly event, dogs welcome. FREE. More info HERE. Eat, drink, and help cure cancer! The Young Supporters Board of the Comprehensive Cancer Center proudly presents The Fiesta Ball on May 5, 2017 at Iron City. Tickets are only $35! More info HERE. It's back, Birmingham... and it's more EPIC than ever! The 2nd Annual Epic City Rush is a mad-dash scavenger race through the streets of Downtown Birmingham. Teams of 4 will have a chance to explore the Magic City like never before. Whether on bike or on foot (no cars allowed! ), your team will try to solve clues, complete challenges, and race back to Railroad Park before time runs out. But don't be surprised when you instantly win some handsome prizes along the way! We did this last year and it truly was EPIC! $100 per team/ $35 indiv. More info HERE. Cooking teams from the Birmingham area will unite to raise funds for Easterseals services, drive awareness of issues affecting the disabled community, and change the lives of individuals and families living with disabilities. Get your tickets early, pre-purchased tickets include zoo admission! Cooking Competition and Demonstrations, Food, Beer, Kids Events, and Giveaways. $20-$55. More info HERE. A “We Love Homewood Day” favorite will offer a variety of inflatables, rides and activities for all ages to enjoy. There is no admission charge to enter Central Park for the festival but to ride and play on the attractions one must purchase an all-day unlimited attractions wristband ($15) or individual tickets can be purchased to redeem at each attraction. FREE. More info HERE. 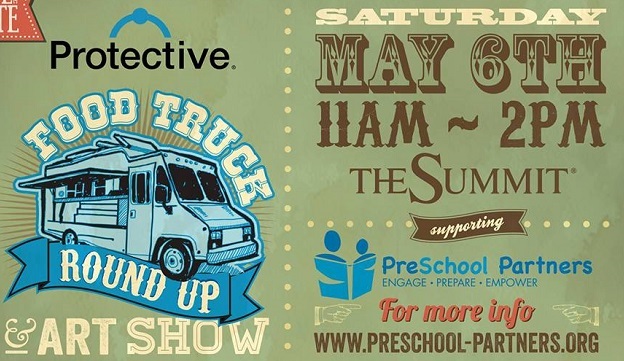 Local food trucks will allow guests to sample from their menus while raising funds and awareness for PreSchool Partners. Foodies and their families will experience live music, local art, amazing food, kid-friendly entertainment and fun for all ages. The entry fee goes directly to supporting our Children's and Parent Programs and includes access to all the food vendors, the Kids Zone (face-painting, balloon art & Soccer Shots), the Art Show & FREE Coca-Cola products! $10. More info HERE..
Trussville City Fest, presented by Trinity Contractors, is a fun, family event in historic downtown Trussville. It will finish with a fireworks show at 9pm! This is a great price for a fun-filled, family-friendly day. You will not want to miss the fun! $5/Kids FREE More info HERE. Come enjoy some great music and help support the Autism Society of Alabama! Gip is a fixture in the Birmingham community and the Juke Joint is a popular spot. This Saturday the music will be at the Bessemer Civic Center. Come out and have a great time at the 2nd annual event! $10. More info HERE. Come out and enjoy live music, food from local restaurants & craft beer from Avondale. The Jeremy Moore band and the The Drennen Brothers Band will both be playing! There will be an air conditioned tent on site! All proceeds will benefit Make-A-Wish Alabama! $25 in adv. More info HERE. 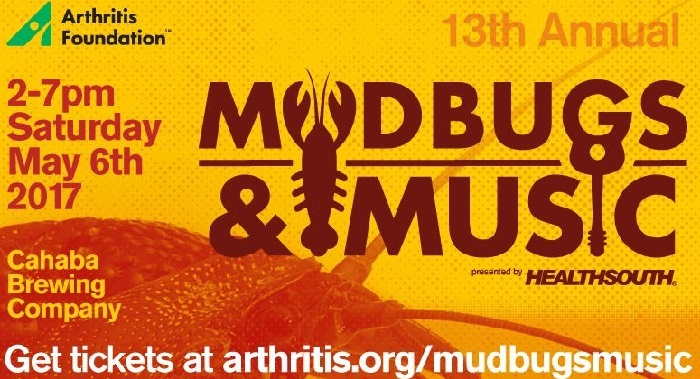 The 13th Annual Mudbugs & Music is back with UNLIMITED crawfish from Shindigs, kid’s activities, pizza for kids, silent auction, and great live music. Proceeds from Mudbugs & Music fund arthritis research, education and programs in the Birmingham community. $15. More info HERE. Good Music. Good People. Good Times. Featuring: Erykah Badu, Goodie Mob, Babyface, Joe, and more. $42-$187. More info HERE. This event is hosted by Alabama Baptist Children’s Homes & Family Ministries in order to raise awareness about the needs of children in foster care. Kids can enjoy inflatables, face painting, games, snow cones, music, and more! FREE. More info HERE. Join this amazing community for their 1st "I love Bluff Park Day". Come hang out with your neighbors, bring a picnic, enjoy live music provided by Mason Music, and close out the evening with a family-friendly movie! $5 per Family. More info HERE. BAO's 26th Annual Arty Party is this Sunday! Over 200 items of art donated from local and regional artists, as well as collectors, will be featured in this year's auction. Guests will enjoy live entertainment from String Theory & Devyani Dance Company, and delicious hors d'oeuvres from B&A Warehouse. Guests may purchase tickets online for a speedier check-in at Arty Party. $50. More info HERE. The Buck Creek Festival is a FREE, family-friendly community event held on the second weekend of May in Helena’s Amphitheater Park. On the banks of Buck Creek, just below the dam, the heavily wooded site together with the incredible stage provides a wonderful venue for people of all ages to enjoy crafts, children’s activities, great food, and fabulous music. FREE. More info HERE. Don’t miss the 5th Annual Birmingham International Street Fair in downtown Birmingham on 3rd Ave N and 20th St N. This FREE event is so much fun. There will be food vendors featuring food from many countries around the world. Fun for the whole family! FREE. More info HERE. You, your neighbors, friends and family are invited to a free event featuring live music, local food and inflatables for the kids on the street right next to the beautiful Patriot Park. FREE. More info HERE. Come travel through several different regions spanning the globe! Drink wine and beer specific to a certain region. Restaurants will also have food available for purchase. Take a break from your travels and enjoy the soothing sounds of live music. The World Tour will be held at the lovely Birmingham Zoo. A portion of every ticket will go to benefit the Birmingham Zoo. $50. More info HERE. Vulcan Park and Museum and the newly formed Five Points Alliance will join forces to bring the community an experience like never before. A “Taste of Five Points” will serve as the culmination of the museum’s exhibit Patience, People, and the Plan-The Revitalization of Five Points South, and celebrate the neighborhood’s 130th anniversary. Attendees will experience all of the elements that exemplify the best of Five Points: landmark culinary hot-spots, trendy retail and its lively entertainment options. $25-$35. More info HERE. The 2017 Regions Tradition is back with the best players on the Champions Tour in action at Greystone Golf and Country Club and a winner crowned on Sunday, May 21. $20+. More info HERE. At Barber Historics, some of the world's finest and most impressive historic racecars compete on the track in a variety of classes based on engine type, car size, and age. This is a rare and special opportunity to see and hear the cars that shaped the history of racing! $10+ More info HERE. Alabama's first and only comedy festival is back. This year the Magic City welcomes the best national and regional comedians. 20+ shows over four days in May. The festival is comprised of comedians featured on Comedy Central, Netflix, MTV, NBC, ABC and even a New York Times best seller! The State of Alabama has never had a weekend of comedy like this festival! Only $40. More info HERE. The City of Pelham and the Pelham Palooza Committee invite you to join us as we celebrate Pelham! Outside activities include a FREE Bungee Trampoline, shaved ice and a few more surprises! Inside activities include vendors, demonstrations, children's activities and FREE ice skating! The Pelham Palooza is a fun family friendly event and offers FREE admission! The free Just Show Up Show will be immediately after! More info HERE. Join us for fun and fellowship for a full day of festivities with plenty of shopping at arts and craft booths, a full schedule of entertainment, and food provided by food vendors. Look forward to a dog pageant, a moon pie eating contest, lip sync contest, and MORE! FREE. More info HERE. Do Dah Day is one of Birmingham’s oldest and most anticipated annual events! This year marks the 39th Do Dah Day. Come on out for a day of music and fun in Caldwell and Rhodes Parks. Do Dah Day, Inc., is an all volunteer, not for profit organization whose function is to raise monies to benefit animals in the Birmingham and Jefferson County areas. FREE. More info HERE. This event combines the best of both blues music and delicious Bob Sykes Bbq. Expect to hear talented award winning local and national blues musicians. Be sure to bring a chair or blanket and set-up your spot for the day. $15+. More info HERE. You've enjoyed our food truck rallies. Now join us for Birmingham's newest food truck experience - Sunday Brunch. Come on out and enjoy "Beats, Brews and Brunch!" Musicians will provide the "Beats," TrimTab Brewery will provide the "Brews," and food trucks will provide the "Brunch." Tickets will be sold for food and beverages. FREE event. More info HERE. Hosted by Brasfield & Gorrie, this outdoor street festival will feature competing grill teams, live music, food trucks, and a Kids’ Zone featuring face painting and games. The community is invited to participate in this family friendly event by purchasing event tickets, t-shirts, Boston Butts, and raffle tickets. $12. More info HERE. Join us on May 27th for the 7th Annual Salsa Showdown Presented byAlagasco, a tasty fundraiser benefitting Sidewalk Film Festival! We'll have all you can eat salsa, guac, queso, and specialty dip tastings from restaurants across Alabama. Plus activities for all ages - live entertainment, kids' activities, piñata smashes, and a hot pepper eating contest. $10 in adv. More info HERE.